Wow!!! Just three days after an anonymous New York collector shattered the record for the highest amount paid for a comic(Action Comics #1), Dallas' Heritage Auction Galleries broke that record by selling an 8.0 graded edition of Detective Comics #27, the first appearance of Bob Kane's Batman, for $1,075,500. 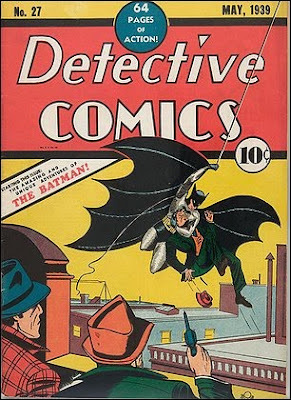 Less than 200 copies of Detective Comics #27 are believed to be in existence today, and experts believe that this copy, purchased by an anonymous collector, may be the highest quality edition that remains.